The Migration Wizard automatically converts applications created in earlier versions of Iron Speed Designer to applications compatible with the most recent version. However, new versions of Iron Speed Designer may change the structure and layout of your application’s web pages and code. To accommodate these changes, and to take advantage of new functionality in these Iron Speed Designer releases, you may need to migrate portions of your application to the new version by hand. Please review the changes made in the versions of Iron Speed Designer relevant to your application. We strongly recommend you review all changes made in all versions subsequent to the one used to create your application. Should you migrate your application to a new Iron Speed Designer release? By design, each version of Iron Speed Designer is installed in its own separate directory. Many of our customers maintain existing applications in older versions of Iron Speed Designer and do not want a newer release to overwrite the older one because they still use the older release. When you no longer need the older release, simply uninstall it via the Control Panel in Microsoft Windows. You can continue developing your application either in (a) the new release or (b) the older release -- it's entirely your choice. Each new release of Iron Speed Designer will open applications created by earlier releases. However, once you bring an application forward into a newer release, you can’t go back; applications are upward compatible but not downward compatible between releases. You might ask why not always bring your application forward into the new release? Quite simply, many developers prefer not to change horses mid-stream, especially if the application is in maintenance mode. These developers typically follow an intitutionalized QA discipline that requires them to completely re-test an application if it were brought forward into a newer version of Iron Speed Designer. So, they prefer to maintain existing applications in older releases and build new applications in the latest release. Other organizaions aren't so rigid, so it largely depends on your organization's culture and practices. 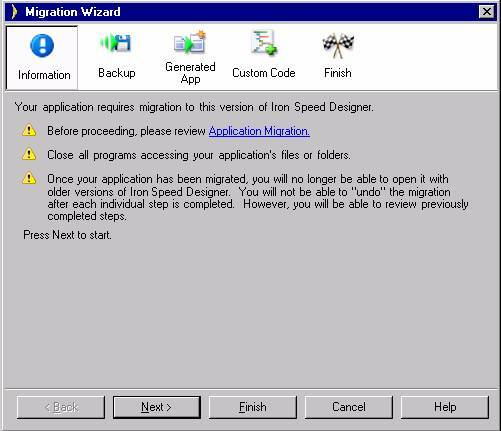 The Iron Speed Designer Migration Wizard is automatically displayed when you first open an application created by an older release. The Migration Wizard migrates your application forward from the release used to originally develop your application to the current release. Your application is automatically changed one step at a time for each release. The migration process makes minimal changes to your application structure, leaving your code and pages largely untouched. Additional features are not added to pages until you manually change page layout in the Page Layout Spreadsheet in Design Mode. That is to say, individual pages are migrated ‘on demand’ rather than en masse. This ‘on demand’ migration leaves your application intact, so your migrated application requires very little additional testing. Applications originally created before Iron Speed Designer V6.2.X cannot be switched to a ‘Web Application for .NET’ or ‘Web Application for Microsoft SharePoint’. Only applications originally created in V6.2 or later can be switched from ‘Web Site for .NET’ to ‘Web Application for .NET’ and ‘Web Application for Microsoft SharePoint’. For example, an application originally created with Version 5.2.1, later migrated to V6.2 and then migrated again to Version 7.1 cannot be converted to a ‘Web Application for .NET’ or ‘Web Application for Microsoft SharePoint’ because it was originally created in Version 5.2.1. On the other hand, a ‘Web Site for .NET’ application originally created with Version 6.2 can be migrated to Version 7.1, then converted to ‘Web Application for .NET’ and finally to ‘Web Application for Microsoft SharePoint’. Iron Speed Designer V6.2 and later use an internal XML file structure for storing your page customizations and other page-related settings that make it very easy for Iron Speed Designer to migrate and update your ASPX pages from one release to the next. Iron Speed Designer V6.2 and later will not automatically migrate your application’s pages. Instead, the first time you use the Page Layout Spreadsheet in Design Mode to customize an individual page, that individual page will be migrated forward into the current release. All other pages remain unchanged. The Page Layout Spreadsheet initially displays a pro forma page layout of pages created prior to V6.0. Pro forma pages show how your page would look in the Page Layout Spreadsheet if it were migrated forward to the current version. Page customizations you made in earlier releases to the underlying HTML layout page are not reflected in this pro forma spreadsheet layout. The Formulas and Code tabs are also not shown on pro forma pages because neither the formulas nor underlying code exists for these pro forma pages yet. When you then use the Page Layout Spreadsheet to customize the pro forma page, the page is automatically migrated to the current release and the older HTML layout page will no longer be used. Version 10.0 and later discontinued support of Large List Selector and introduced new Quick Selector control. After you migrate application after the first build all your Large List Selector control buttons will be removed. You can configure application to create Quick Selector Control instead of DropDown list for all your new pages (using Application Generation Options Wizard / New Page and Charts options / Common Page options / Preferred Selector Control) and / or convert existing DropDown list controls to Quick Selector via Property Sheet. However it is very important to remember: Quick Selector controls are build automatically for each page when you click build first time after migration. They have Quick Add button which open Add Record Pop-Up page in the modal pop-up window. So you need to create Add Record Pop-Up pages for all tables used in the application PRIOR to the first build. We recommend doing this immediately after migration: as soon as migration succeeds before running application in browser or live preview or building it open Application Wizard and add just Add Record Pop-up page for all used tables. This will ensure that quick add button in the Quick Selector will work properly if you ever decide to use it. Earlier Iron Speed Designer releases used different code models, meaning the underlying architecture of your application – the code classes, methods and events that comprise your application code. V4.0 code model (July 13, 2006). Applications created in V4.0 and later use the V4.0 code model. Migrating an application created with an earlier code model require you to manually migrate (re-create) any code customizations you added to your application that depend on the previous code model. For example, migrating an application created in V3.1 to the current release requires you to port your code customizations to the updated (migrated) application. However, applications created with V5.0 do not require code customizations to be manually ported because they were created using the current code model. If your application uses a Custom Page Style different from the Page Styles included in Iron Speed Designer you must migrate the Page Style manually to the new version. To migrate manually, you have to copy the whole page style folder into a new Iron Speed Designer \ Design Themes folder, changing Version number in all xml files. New styles and images might be introduced in new release for web page and for mobile pages, so you might have to update the BaseStyles.css file and \Images folder in your Custom Page Style. Follow this process to migrate an application created with an earlier version of Iron Speed Designer. Step 1: Open your application with Iron Speed Designer. The Migration Wizard is displayed. Follow the steps outlined in the Migration Wizard to convert your application to the new formats. Step 2: We strongly recommend you let the Migration Wizard back up your application. Step 4: Rebuild your application (Build, Rebuild All) in Iron Speed Designer. This updates your application’s source code in the latest formats. If your original application contains any files or folders created by source code control software then during migration they will be deleted so that migration may proceed smoothly. If you need these files and folders, check the migrated application files back into the source code control system and it will recreate the folders for you. If not, then you can add these folders manually from the application back-up created by Iron Speed Designer as part of the application migration process. The Subversion source code control system adds a .svn folder within each folder of the application. Subversion then stores identical copies of the files in these subfolders. So if you have a ShowCustomerTable.aspx, .vb and .controls.vb in the primary folder, files with the same names are stored in the .svn folder. The Migration Wizard is designed to look at every file in the application folder and each sub folder recursively. Since the .svn folder contains a duplicate set of files, the migration step would attempt to migrate these as well. Since these files should not be migrated, the Migration Wizard deletes them prior to migration. Subversion will recreate the folder and files when the files are rechecked back into the source code control system.